HOLLIS RESNIK CHICAGO SHAKESPEARE: Miss Judith Smith as Gremio/Peter in The Taming of the Shrew, Carlotta Campion in Follies (Jeff Award). 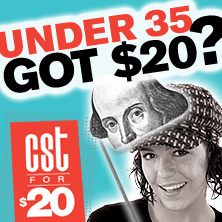 CHICAGO: Candide, A Little Night Music (Goodman Theatre); productions with Court Theatre, Northlight Theatre, Marriott Theatre, Apollo Theater Chicago, Ravinia Festival. REGIONAL: Amanda in The Glass Menagerie, Judy Garland in End of the Rainbow (Milwaukee Repertory Theater); The Light in the Piazza (Arena Stage); Grey Gardens (Philadelphia Theatre Company); productions with Shakespeare Theatre Company, Long Wharf Theatre, Alliance Theatre, Indiana Repertory Theatre, Arizona Theatre Company. TOURS: Les Misérables, Dirty Rotten Scoundrels, Thoroughly Modern Millie, Mother Superior in Sister Act. AWARDS: Twelve Joseph Jefferson Awards, Helen Hayes Award, two Sarah Siddons Awards, Lunt Fontaine Fellowship 2012.